It wasn't exactly the sound I was expecting to hear. I mean, there I was on my way to the washroom, and as I was passing room 313, I heard the sound of a violin. 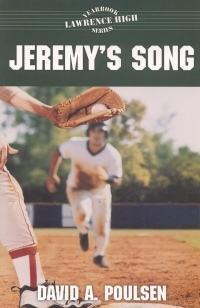 In Jeremy's Song, the third novel in the Lawrence High Yearbook Series, tenth-grade baseball star Brad becomes friends with Jeremy, a violin player whose talent is ignored by everyone, even his father. Jeremy is also friends with Brad's love interest, Arlene, and the three attend games and recitals to support each other. Brad is injured by Arlene's boyfriend's brother in a game, and then faces Jeremy's refusal to perform in a big show his father has not shown up for. He and Arlene teach him to be proud despite his father's indifference, while Arlene reveals her now ex-boyfriend had conspired with his brother to injure Brad. 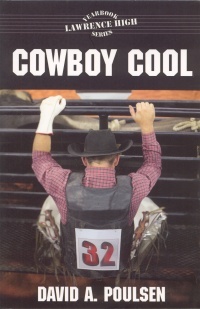 In Cowboy Cool, the fourth book in the series, computer geek Alex teams up with new student and bullrider Kelly to sell bull-analysis reports to professional rodeo riders. He becomes increasingly worried as Kelly appears to be linked to The Devil's Platoon, a local gang with a vendetta against Lawrence High. When the gang defaces the school's sign, Alex and Kelly help repaint it, but Kelly is confronted by gang members who insist he re-tag it, forcing him to make a decision to defy them. A brief fight ensues, the gang leaves, and Kelly reveals how he'd been trying to impress an ex-girlfriend by helping the gang. These two high-interest/low-vocab novels are full of promise: Poulsen has created great narrative voices in both Brad and Alex who tell their stories like teens would. The baseball and rodeo scenes are exciting, and the plots have potential. Both books, however, suffer from poor editing, leading to inconsistencies (Arlene's boyfriend's brother is referred to as both Tyler and Matt), incomplete characterization (the members of the gang aren't even named, including their ubiquitous "leader"), and an incomplete backstory (why does the gang have a vendetta against the school?). The highly caricatured gang is referred to as "the worst gang around - not the kind of people parents want their daughters - or sons - associating with." To which a reader might ask, is there a kind of gang parents would want them associating with? For compelling gang drama, try Alison van Diepen's Snitch instead and leave this crew alone. Both books are not recommended. Todd Kyle, a former President of the Canadian Association of Children's Librarians, is currently a library branch manager in Mississauga, ON.